At a personal level food is what sustains us on a daily basis; at a regional level agriculture is still the backbone of our economy in spite of increasing challenges facing farmers. 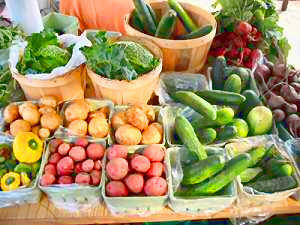 What could be more central to our lives, or a more obvious place to start in rebuilding the vitality of our communities, than a healthy, sustainable, local food system. On average the food that we eat travels 1,500 miles before it reaches our plates, while most of what is grown locally is shipped out of the area to be processed elsewhere. Meanwhile only 21 cents out of each dollar a consumer spends on food finds its way into the pocket of the farmer. This is a national and even global problem with a local solution. If we can keep both our food and our food dollars in the region we can increase the viability of local farms and increase the quality of food available to consumers, while creating local jobs in the processing and value added sectors. Creating a local food system requires creativity, ingenuity, and collaboration. It means bucking the trends of an increasingly specialized and globalized economy. It means making a conscious decision to do business with our neighbors instead of multinational corporations. It means taking risks by trying new crops and practices, or returning to old ones. It means rediscovering the joy of preparing food with friends and neighbors, of personally knowing the farmer who grew the food on your table. FoodRoutes: Where Does Your Food Come From?